With all the popular hair trends out there, it can be a challenge to determine which highlights are best for you. If you want to make a statement with your hair color, but don’t want anything too outrageous, these bold and modest highlight colors may work well for you. Blonde highlights are one of the most common hair trends, as women with various hair colors are choosing variations of blonde streaks for their hair to complement brown or even black hair. However, this can be very striking. A more modest choice would be getting blonde highlights that are a little lighter than your natural blonde or light brown hair. If you have light blonde hair, platinum highlights are a stylish summer choice. This choice is best if you have cool undertones, i.e. you look great in green or blue clothing. 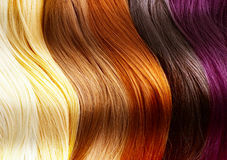 Amber blonde highlights are best if your hair is a honey or cinnamon color, and your skin tones are on the warmer side. If your hair is a rich brown or black hue, dark red highlights are subtle but still noticeable, especially in the sun. Red or burgundy highlights are especially flattering if you have warm skin tones and red or peach clothing flatters you most. Keep these hair color trends in mind the next time you visit your stylist. Chances are you’ll be very satisfied with the results, as the modest change will make a significant difference in your look.